If an icon in OS X El Capitan is locked or busy (the application is currently open), or if you don’t have the owner’s permission to rename that icon, you can’t rename it. Similarly, you should never rename certain reserved icons (such as the Library, System, and Desktop folders). To rename an icon, you can either click the icon’s name directly (don’t click the icon itself because that selects the icon) or click the icon and press Return once. Either way, the icon’s name is selected and surrounded with a box, and you can type a new name, as shown here. In addition, the cursor changes from a pointer to a text-editing I-beam. An I-beam cursor is the Mac’s way of telling you that you can type now. At this point, if you click the I-beam cursor anywhere in the name box, you can edit the icon’s original name. If you don’t click the I-beam cursor in the name box but just begin typing, the icon’s original name is replaced by what you type. Change an icon’s name by typing over the old one. If you’ve never changed an icon’s name, give it a try. And don’t forget: If you click the icon itself, the icon is selected, and you won’t be able to change its name. If you do accidentally select the icon, just press Return once to edit the name of the icon. Yosemite was the first version of OS X to allow you to rename more than one file at a time, and El Capitan continues the tradition. To rename a group of files, first select them all, and then right-click anywhere in your selection and choose Rename x Items (where x is the number of files selected) from the pop-up menu. A sheet appears with options for adding or replacing text in the existing file name, or creating a custom format with indexes, counters, and dates before or after whatever new file name you choose. A more powerful third-party app is Better Rename ($19.99 in the Mac App Store); it has useful options that El Capitan’s new batch-renaming feature doesn’t offer. On the other hand, El Capitan’s new batch-renaming feature is pretty good and all that many people will ever need. For those who wish it were a little more robust or powerful, Better Rename is just what the doctor ordered. One last thing: If you have two or more icons you want to move to a new folder, select the items and choose File→New Folder with Selection, press Command+Control+N, or right-click or Control-click one of the selected items and choose New Folder with Selection. 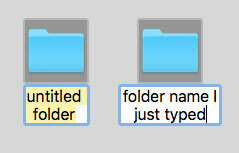 All three techniques will create a new folder, move the selected icons into it, and select the name of the new folder (which will be New Folder with Items) so you can type its new name immediately.